Chicken thighs, boneless, skinless (Cut into 1-inch pieces) 1-1/2 lb. Yukon gold potatoes, small cubes 1/2 lb. Almonds, toasted, for garnish 2 Tbsp. Soak the sliced almonds in the hot water for 15-20 minutes. 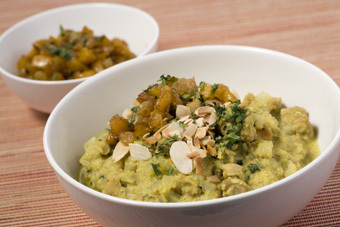 Blend the almonds with the water in a food processor or blender until it forms a smooth puree, similar to a cream consistency (about 3-5 minutes). Place the onions, garlic, ginger, chicken broth, and curry into a 2 qt. microwave container and microwave at P10 uncovered for 2 minutes until aromatic. Stir in the almond paste and mix in the chicken. Microwave covered at P10 for 4 minutes, stirring once. Add the potatoes, coconut milk, and salt and microwave at P7 covered for an additional 5 minutes, until the chicken and the potatoes are cooked. Top with chopped cilantro and toasted almonds.